The Gradient node is similar to a Colour Card in which it fills all of the space in the stage, except that instead of filling it with a solid colour, it fills it with a configurable gradient. A gradient is a colour that tapers into another colour. The Gradient node can generate linear or radial gradient, between colours with or without transparency. The colours as well as the start and end points of the gradient in the stage can be configured and animated. The Gradient node covers the entire camera frame and beyond. You do not need to scale it up or down. It will automatically cover an infinite zone. You simply need to connect it behind your scene's elements. You can connect it in front of some elements you want to cover. By default, the Gradient has a Z ordering value of 0. 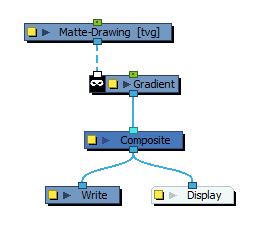 When you select the Gradient node, the Camera view displays yellow triangles to indicate that it's selected. Being a generator, the Gradient node does not need an input image. It generates a gradient on its own, based on its parameters alone. Just like Element nodes, Gradient nodes can be hooked to a peg, allowing you to easily move, rotate, scale and animate the gradient. Optionally, the Gradient node can be connected to a matte image. In this case, the gradient will only be applied over the opaque areas of the matte. 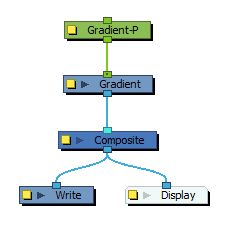 In the Timeline or Node view, select the Gradient node. In the Camera toolbar, click on the Show Control button. Click and drag on one of the points to change its position. Use the Gradient property editor to modify the values of the gradient and the position of its output. Linear: Lines of colour are drawn perpendicular to the axis between point 0 and point 1. Radial: Circles of colour are drawn with point 0 as their center, with a ray progressing between point 0 and point 1. The colour of point 0. The gradient will start with this colour and taper to the colour of point 1. Red: The value of red in the colour. Green: The value of green in the colour. Blue: The value of blue in the colour. Alpha: The opacity of the colour. The position of point 0 in the stage. The gradient will start from this position and end at the position of point 1. If you want to animate the point, you can choose which type of function to use to store the animation. 2D Path: The horizontal and vertical position are on the same function. This makes the point move in a curvilinear trajectory between each keyframe. Separate: The horizontal and vertical position are on separate functions. This makes the point move in a straight line between each keyframe and it allows you to modulate the trajectory differently on each axis. (x) Axis The position of point 0 on the x-axis. (z) Axis The position of point 0 on the y-axis. The colour of point 1. The gradient will start with the colour in point 0 and taper to this colour. The position of point 1 in the stage. The gradient will start from the position of point 0 and end in this position. (x) Axis The position of point 1 on the x-axis. (z) Axis The position of point 1 on the y-axis. Offset Z The position of the Gradient layer on the z-axis. Depth This parameter can be used to determine whether the gradient displays behind or in front of elements with the same position on the z-axis. Elements and Colour Cards also have a depth parameter. Invert Matte If an image is connected to the Gradient node's matte port, by default, the gradient is only applied on the opaque areas of the matte. If this parameter is enabled, the gradient is applied to the transparent areas of the matte instead.